If you've never seen the full version of Abbott and Costello's "Who's on First" take a look at it here. After all the years that have passed since they first performed it in the 1930s it is still a classic. Another burlesque style skit that hasn't received much recognition over the years is the Marx Brothers "Tutsi Fruitsy Ice Cream" skit. 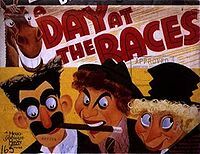 The scene from the 1937 film, A Day At The Races, is often considered one of the funniest scenes in the movie. Chico gives Groucho a tip on a horse, but all in code, so that Groucho has to decipher the code. Check it out. If you have a particular favorite, please send it along to us at Contact Us so that we can share it with the world. "Yo Adrian" you know "there's no cryin in baseball". "I guess what I'm trying to say is, if I can change, and you can change, everybody can change." "There's one thing I want you to do for me. Win. Win!" You can make some meaningful sentences from the famous quotes from the Best Sports Movies. See our favorite quotes of all time. The Rocky series, written by Sylvester Stallone, has many memorable scenes, music, and quotes. Some of which I will call "Rockyisms". Among them, probably the must quoted, "Yo, Adrian!" from the first Rocky. "I must break you." from the lips of Ivan Drago in Rocky IV. One of my favorites is from Brian's Song when Gayles Sayers is accepting the award: "I love Brian Piccolo. And tonight, when you hit your knees, please ask God to love him." A real tear jerker. "Show me the money!" from Jerry Maguire. I'll bet that you've used that one before. Here are the others on our list. "In the hole" Bill Murray in Caddyshack. "I sure miss playing basketball. I got depressed as hell when my athlete's foot and jock itch went away." from Breaking Away. Got any that you would like to share with us? Please send them along to us at Contact Us so that we can share them with the world. Every year a sports movie comes out based on a true story. I often wonder why it takes so long for some of these stories to be told. There was a movie (The Perfect Game) due out last August, but still hasn't been released, about the Mexican Little League team that won the World Series back in 1957. Why did it take so long for someone to tell their story? That got me to thinking, are there any other stories, like their's, that haven't been made into movies yet? I have a couple in mind, but I want to here from you first. Do you know of any "based on a true story" sports movies that haven't been made yet? Let's tell the world about them. Who knows, maybe a story you share here may become the inspiration for a future movie. We can tell the world that heard it here first! Maybe Ron Howard, Clint Eastwood or Martin Scorsese may read about it here and get inspired by you. You may be the next world famous movie writer. Put your thoughts here and get it published right here on the net. If you would like, we will even attach your picture to the story. Use the form below and tells us what you think is the Best Sports Movie That Hasn't Been Made Yet is. Have one to share with the world? What do you think is the Best Sports Movie That Hasn't Been Made Yet?